One of the most enduring debates in the NBA the past two seasons has involved the Golden State Warriors’ second- and third-best players, Draymond Green and Klay Thompson. 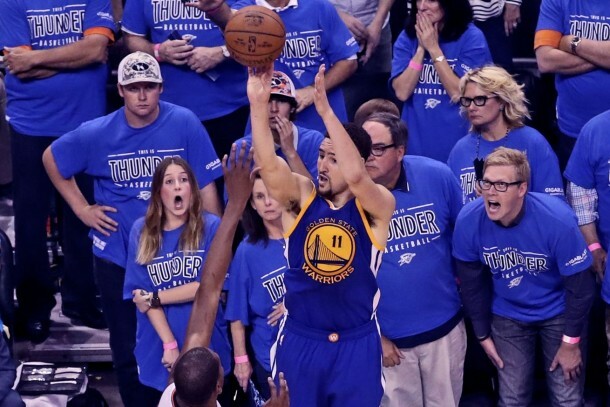 You will note that Draymond is positioned first and Klay second. That’s because I firmly thought Draymond was the better — or if not better, more indispensable — player than Thompson. Keep in mind, before you read any further: Debating who’s the second-best player on an historically great NBA team is akin to picking the second-best Michelangelo painting, or the second-best work of Shakespeare, or the second-best Bach concerto. Being third ain’t bad. Being third is better than 99 percent of everyone else in a given field of expertise… just not as good as two people. In other words, this is not an attempt to find deficiencies; it’s a pursuit of whose strengths are stronger. Throughout the 2015 journey to a championship; the 2015 regular season; and even the first two rounds of the playoffs, Draymond appeared to be the second-best Warrior. His ability to guard so many different positions, run the break, facilitate for his teammates, control the glass, and generally dominate games without scoring — something Klay cannot do with any regularity — stamped Green as the non-Stephen Curry player the Warriors could not live without. Draymond’s versatility is to “positionless basketball” what Steph is to three-pointers in the modern iteration of professional basketball. Draymond enables the Death Lineup to be what it is. He enables the Warriors to play small ball with such lethal potency. He remains a marvel. 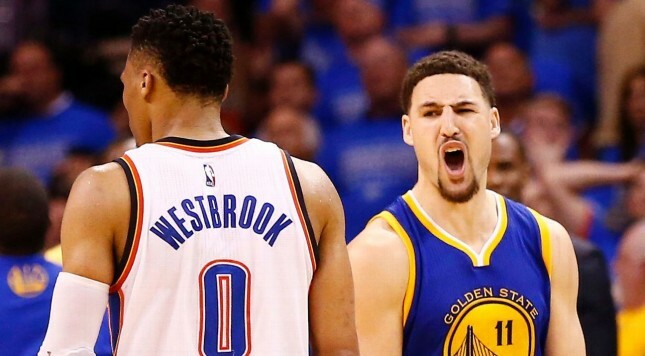 What we saw in the Oklahoma City series, though, offers powerful evidence — far more powerful than anything previously witnessed — that Klay really is the second-best Warrior, the Curry companion Golden State relies on to keep this team afloat when No. 30 is resting, or injured, or simply off his game. The point a lot of people will make in defense of Draymond (as the second-best Warrior) is a valid one: Oklahoma City’s length and size presented unique problems for Green. This specific matchup rendered Draymond more vulnerable than any other matchup in the NBA. For this reason, it could still be argued that No. 23 is No. 2 on the Warriors in terms of value and overall quality. That might be true. However, Klay Thompson took his game to the proverbial next level in this series. He was the MVP, even though Steph played like an MVP in the final three minutes of Game 6 and the second half of Game 7. We all remember LeBron James scoring 45 points on the road in Game 6 against the Boston Celtics in the 2012 Eastern Conference Finals. That mighty display saved the Miami Heat from elimination in a building where they haven’t done well over the years. LeBron, not yet a champion on that night, faced the greatest crucible of his career, and he conquered it. Klay Thompson didn’t face the personal pressure LeBron had to deal with that night, but he did face team pressure and the prospect of a 73-win season falling short of a championship. Super-duper stars, the creme de la creme, do that. Players do what Thompson did in Game 6. They do what Thompson did in the second quarter of Game 7, when the Warriors were once again plunged into survival mode. Yes, this matchup was tough for Draymond, but Klay repeatedly put the Dubs on his back — not merely in elimination games, but in crisis points of elimination games, one of them on the road. If Draymond had been the non-Steph Warrior Golden State needed the most, Klay Thompson has changed the conversation. It’s not a final verdict — we’ll see what happens in the NBA Finals — but I and many other basketball observers have been given fresh reason to reconsider one of the league’s great debates.